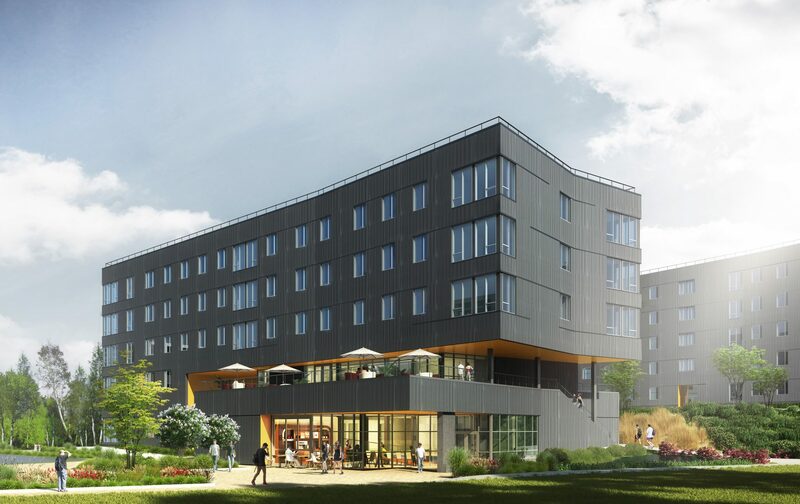 Bellevue College’s first 133,000 square foot student housing is built with sustainability at forefront of the design. Using the building certification framework of LEED (Leadership in Energy and Environmental Design), Bellevue College has created a LEED® registered project that engages students in sustainability practices and employs the building and site as a teaching tool. Stormwater runoff is a critical issue on campus, due to impermeable glacial till soils, so we decided to turn a costly geotechnical dilemma into a highly visible sustainable design asset. Using an adjacent soccer field’s renovations, the underdrainage plan was resized to handle additional runoff from the student housing site, which reduced site impacts from construction, as well as the need for an underground tank and redundant infrastructure. 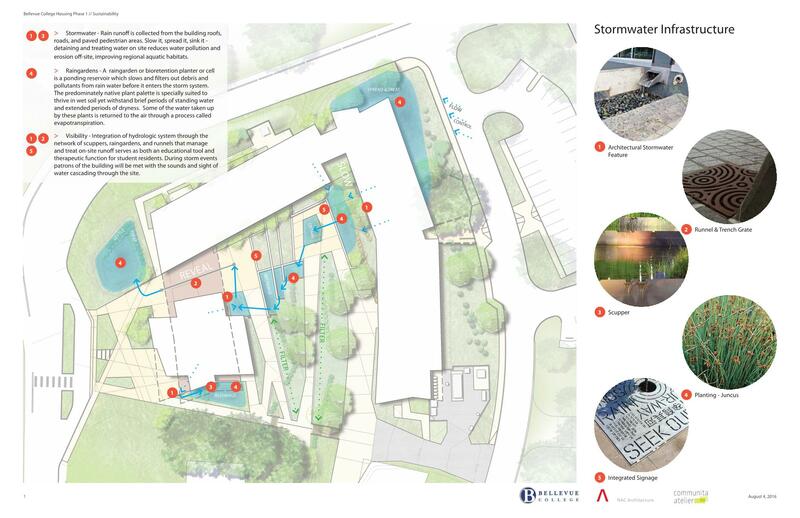 To showcase some of the stormwater management features, The Student Environmental Sustainability Fund and the ASG voted to purchase and feature cascading bioswales as a poetic methodology to manage the stormwater. Beyond highlighting the travel and topography of water through a series of interconnected rain gardens, indigenous, fragrant, and edible plants were selected to enhance the human experience of the outdoor spaces. In addition, the construction team salvaged large specimen boulders and madrone trees to surround these rain gardens with authentic local materials. The cumulative effect reduced approximately 3,000 gallons of storage from the campus detention vault system. With respect to the building design, we worked together with the contractor to build a durable, airtight and watertight envelope. Simple strategies such as thicker insulation, operable windows, and abundant natural daylighting characterize the façade design. The exterior details are clean, minimal, and well executed. Contrasting crisp metal edges and dramatic cantilevered overhangs carve away from the simple angular form of the residential wings. These covered spaces offer shade from the summer sun and cover from the winter rains. Elevated roof decks feature amazing views over campus athletic fields to the Seattle skyline and Olympic Mountains in the distance. The ground-level HUB with café, lounge, and classrooms create a public space for the campus community to gather and mix with residents inside the student housing building. To minimize the environmental impact of student residents, we leveraged the strength of the student floor communities to enhance energy conservation. Besides employing super-efficient domestic hot water heat pumps, LED lighting throughout, solar-ready rooftop design, secure bike parking, and reduced automobile parking with electric vehicle charging, we sub-metered electricity for each learning community. This usage data is captured in a dashboard designed to motivate the communities to compete with each other and reward energy conservation for the building as a whole (LINK COMING SOON TO THE DASHBOARD). 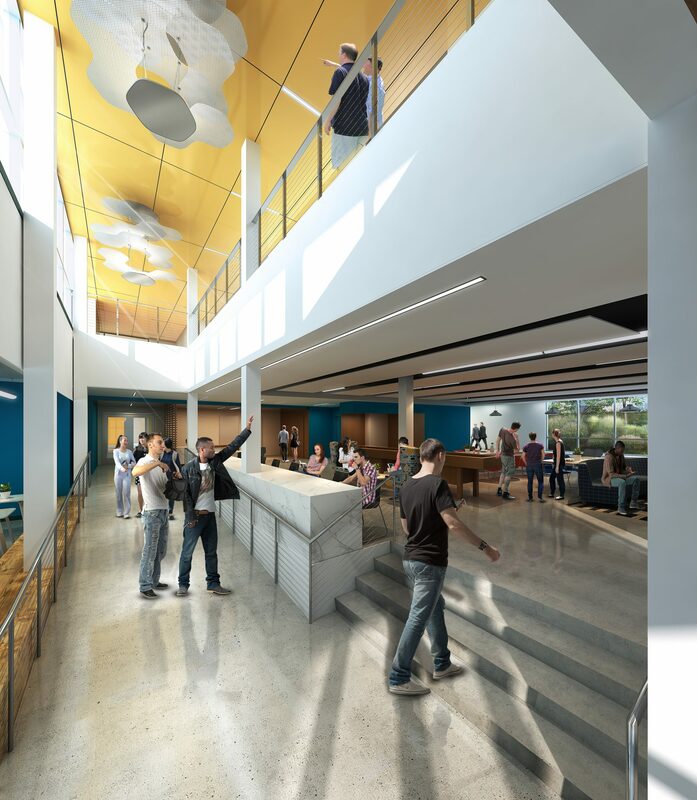 To help support student life programming, floor lounges in each wing feature interior materials selected to be sustainable, durable, and high quality. Indoor products were required to meet strict VOC (volatile organic compounds) emission and indoor air quality criteria for LEED® , with certifications including FloorScore, Green Label Plus, and Greenguard. It was also very important to the College and the design team that interior products not only contained recycled material, but could be easily maintained and recycled at the end of their life cycle. With Bellevue College recently completing construction of its first residence hall with students ready to move in Fall 2018, this LEED® registered project opens an exciting new chapter as the campus evolves from a commuter to a residential College. The building and site design represent a true collaboration between student and campus stakeholders, faculty, staff, and the community as a whole. As we pursue Platinum for this LEED® registered project, the new residence hall will set the standard for future sustainable development for years to come.